Create a new Net Class. Move the GND and VCC nets into the Power net class. 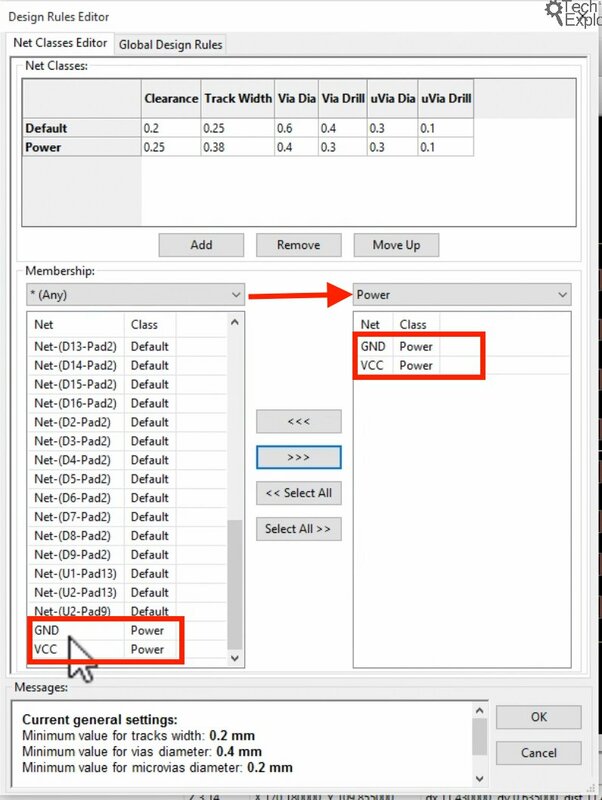 In the screenshot above, notice that the filter of the right membership list is set to Power. 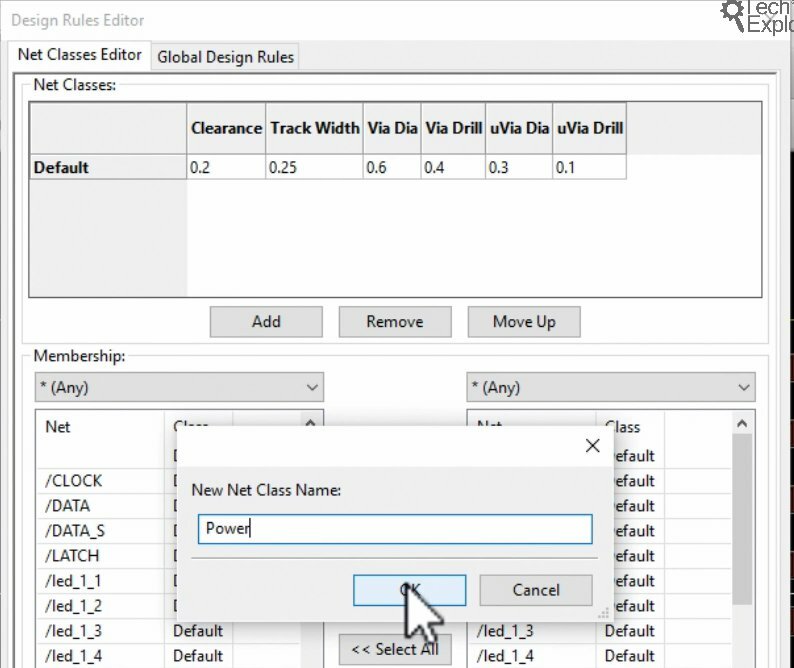 After you set the filter, find the GND net in the right membership list, select it, and click on the “>>>” button to move it to the right list. Do the same for the VCC net. 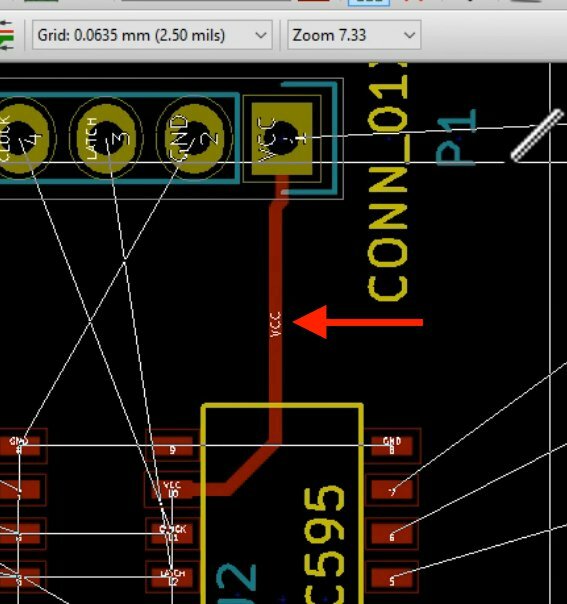 Then, click on the green Wire button or type “W” to select the wiring tool, and create a wire between the Vcc pin of the connecter and the Vcc pin of U2. Just wired the first VCC net. Notice that the name of the wire is written on it: “VCC”, the name of the net. 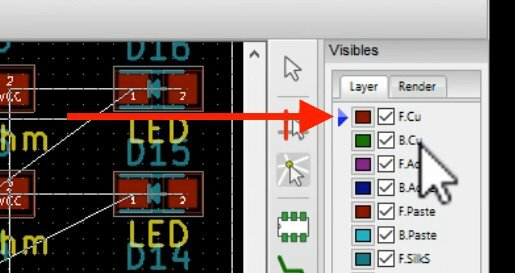 Select the B.Cu layer for the ground signals. You will be unable to complete the green wire! 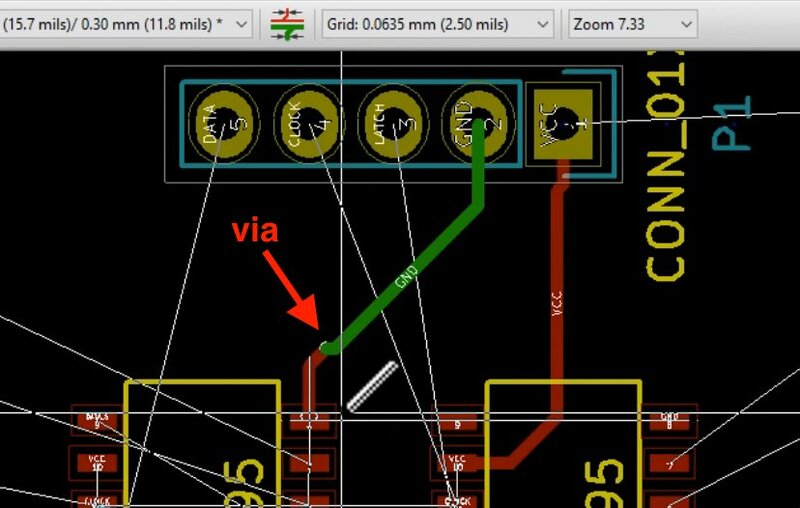 Use a via to switch a wire between layers. 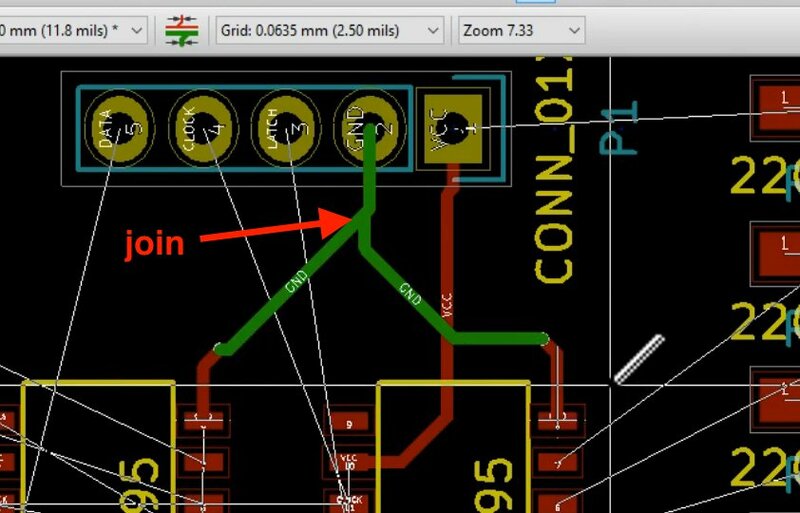 Connect the GND pad of U2 by joining a new wire to the wire of the U1 GND. 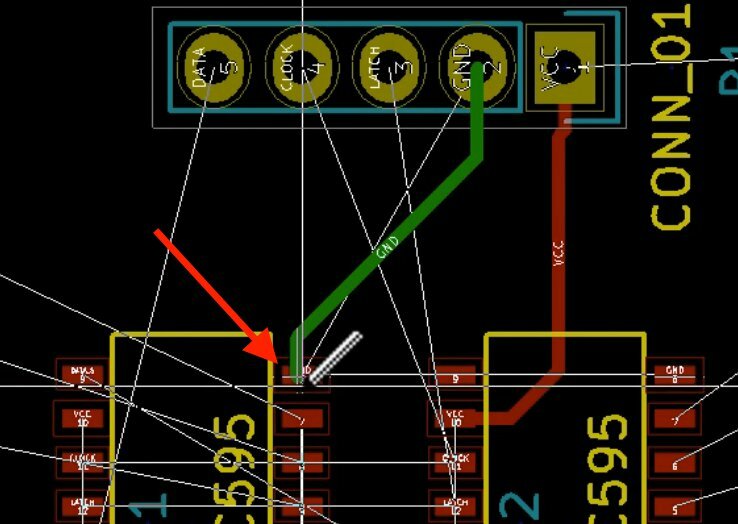 Wiring the connector pins to U1 and U2. 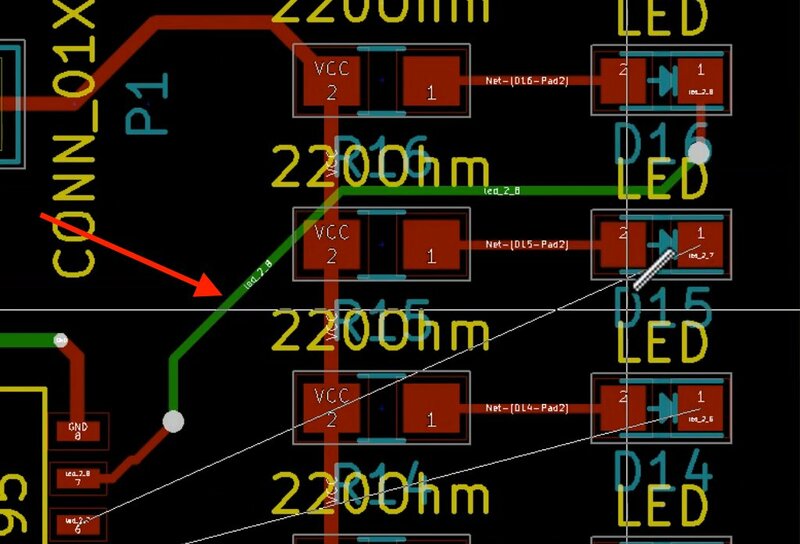 The orientation of the resistors can be improved in order to minimise the length of the VCC wire. 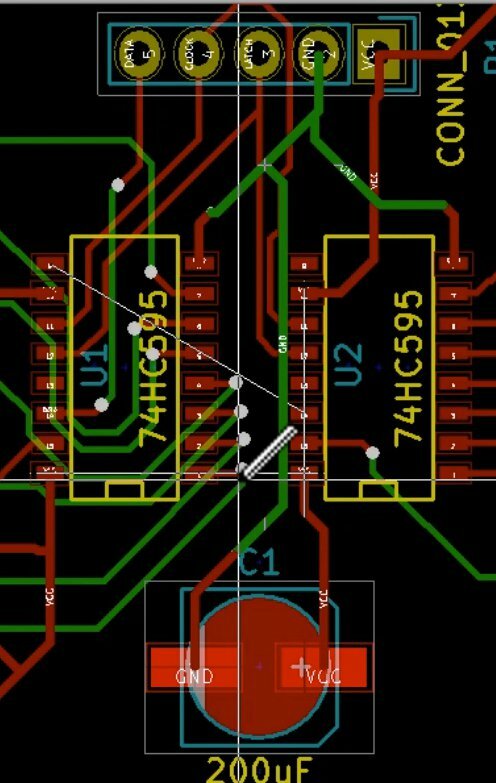 The Connector and Resistor VCC pads are connected. 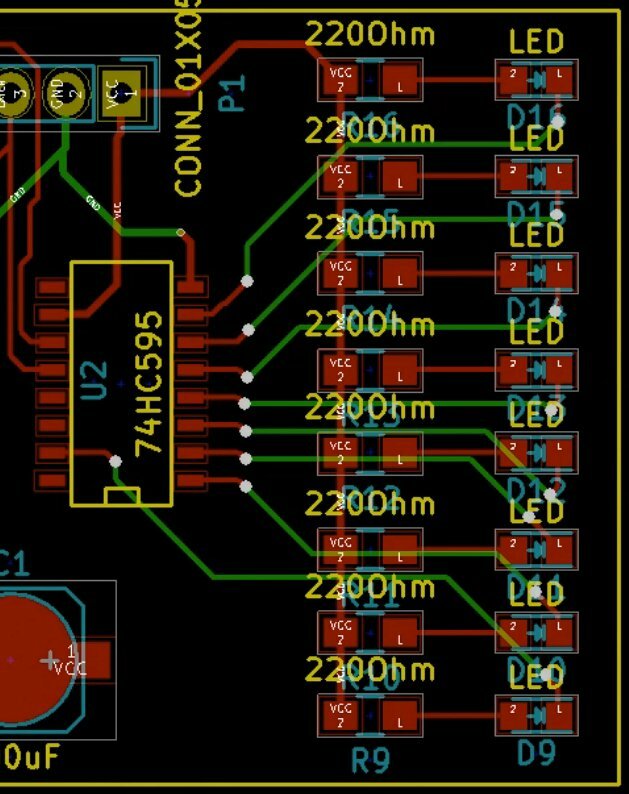 The LEDs are also connected to their resistors. 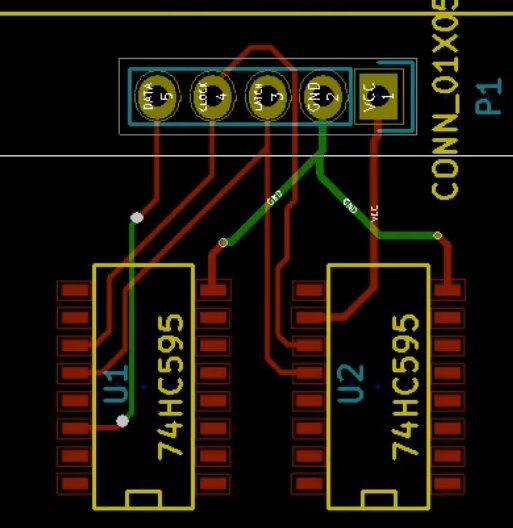 Routing the LED to the data pins of U2. 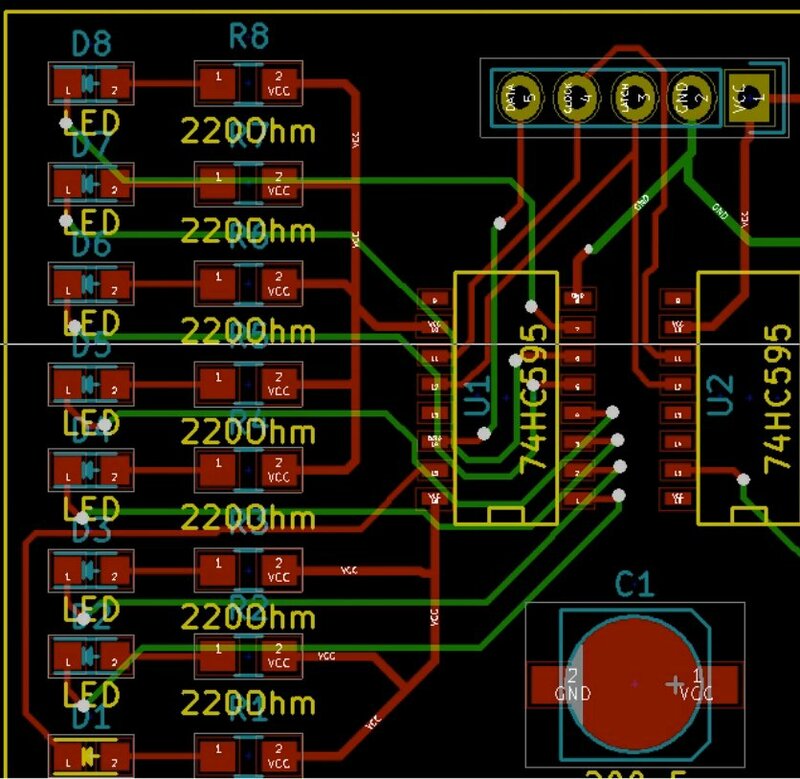 The wiring on the right side of the PCB is complete. 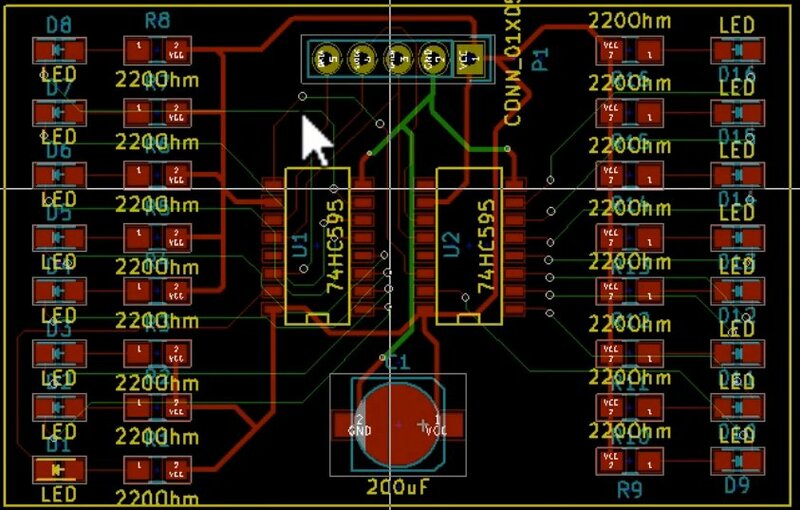 The left side of the PCB is complete. At this point I can see a couple of ratsnest threads, which means that I have unconnected pins. The canvas is crowded, so I find it hard to see exactly which pads are left unconnected. 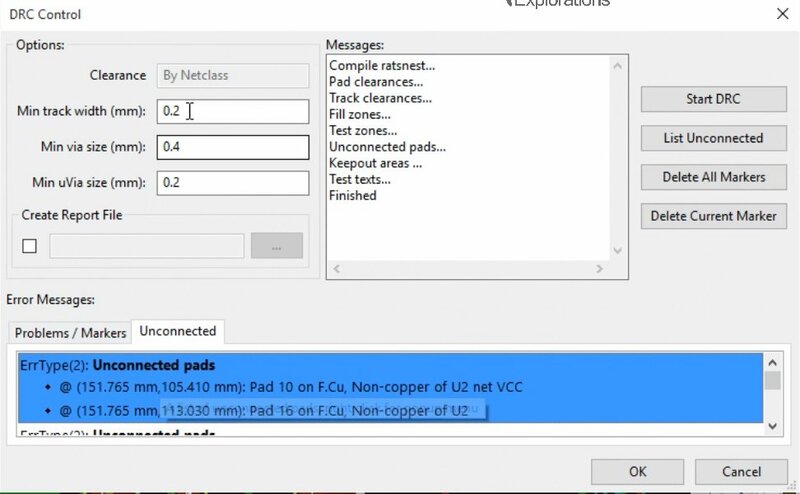 A good solution is to do an DRC, and get a list of unconnected pads. The DRC gives a handy list of unconnected pads. The DRC tells me that pad #9 of U1 should be connected to pad #14 of U2, pad #10 of U2 should be connected to pad #16 of U2, pad #16 of U1 should be connected to pad #16 of U2, and pad #2 of R4 should be connected to pad #2 of R3. Let’s do these connections. 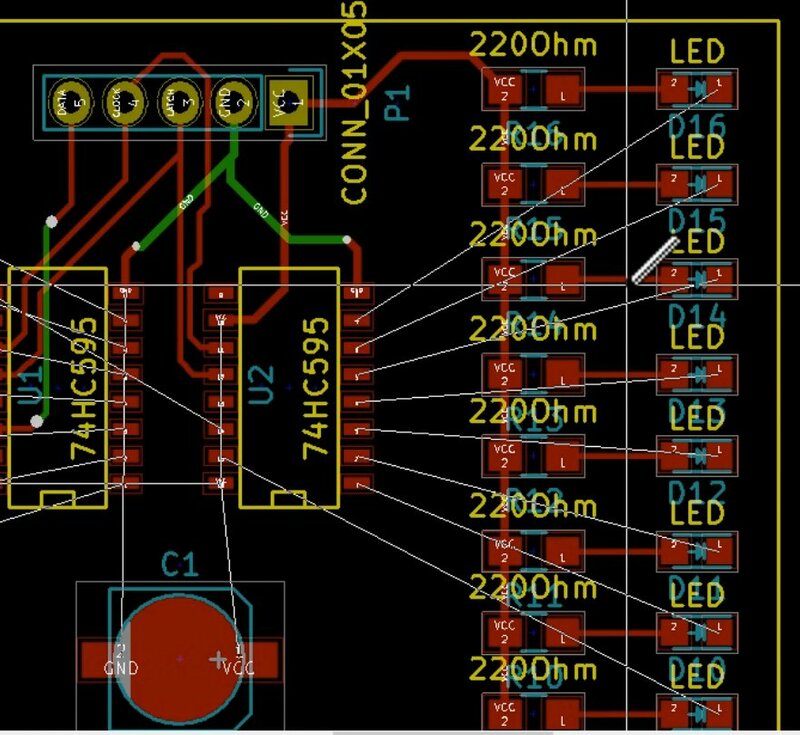 Wiring takes some time to do properly, and several iterations. You should not be afraid of deleting traces and redoing them better! In the next chapter, will will work on the copper fills.